This is Bruce Barnes back in the 1980's at Fort Lewis. 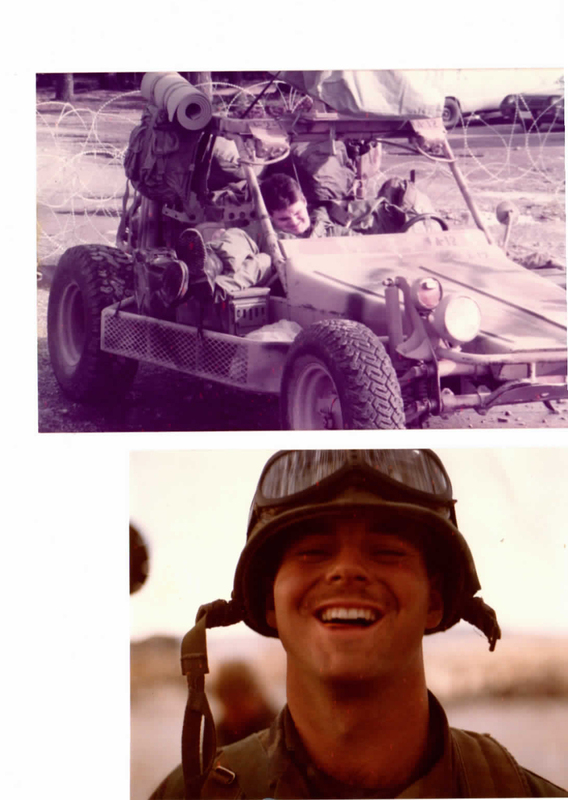 He not only got to drive a FAV (notice the huge smile on his face), he was the FIRST to be licensed to drive them and was trained by Chenowth after the first batch of FAV's were delivered to Fort Lewis! With his experience came a great honor. He was given the huge responsibility of training hundreds of other drivers. Bruce was asked to work with the Army graphics group to develop the FAV Logo. This was before the age of desktop computers so this was created the old-fashion way, by hand. It incorporates the symbols for I-Corps and 9th Infantry Division. Another great photo from Bruce. This FAV was dropped from 100+ feet by a Blackhawk. See the full story in the Stories link from the main page. I think I can fix that! 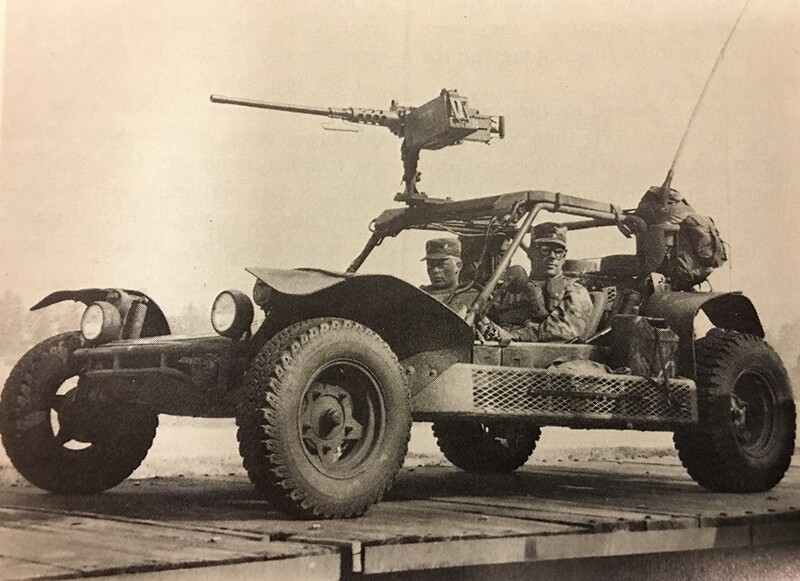 Now my Favorite Fast Attack Vehicle photo. 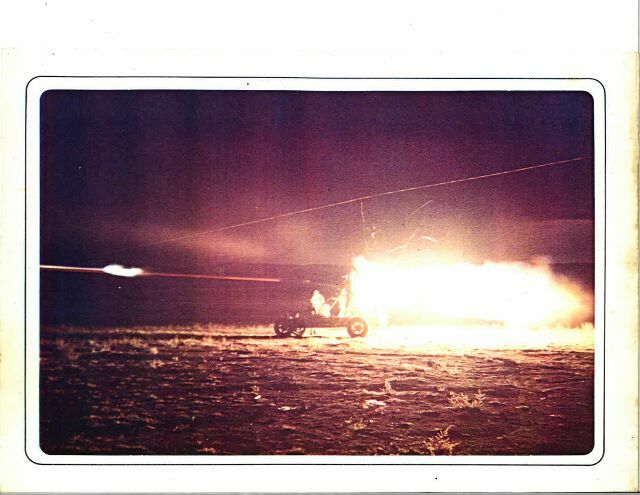 A FAV fires a TOW missile at night in the Yakima test area. You don't want to be in front of or behind a TOW! From Dave. Read more about it in the Stories section. 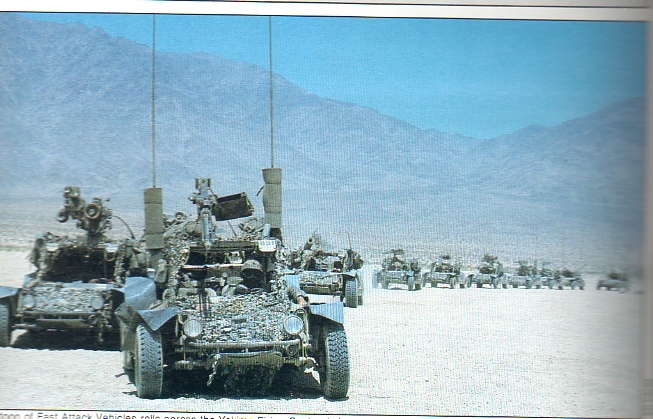 12 Fast Attack Vehicles at Yakima. 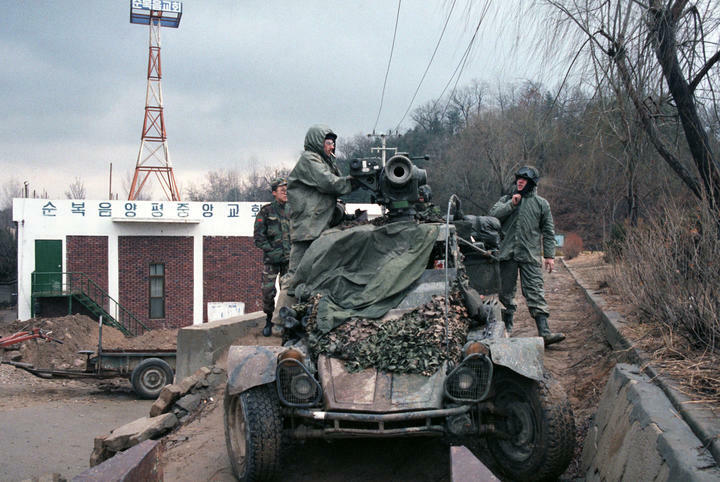 The M1040 (M2 .50 Caliber) and M1041 (TOW) versions can be seen. The Blackhawk could carry 2 FAV's and crew. 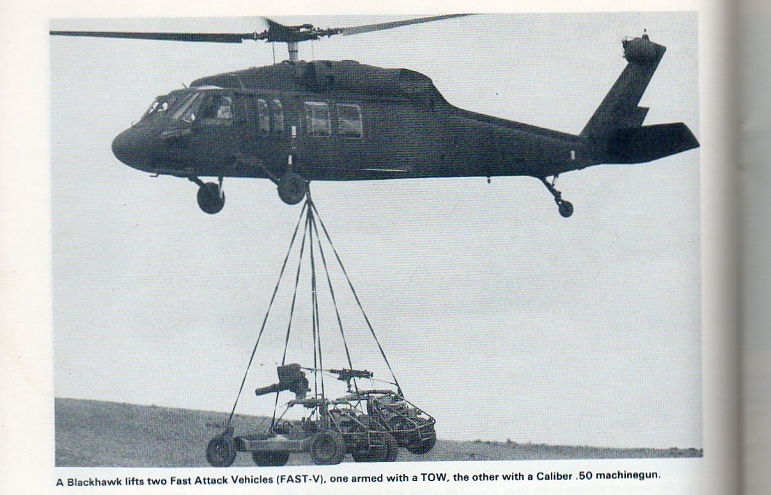 A Blackhawk could not carry a armored and loaded HMMWV. A C130 could take 7 FAV's plus crew anywhere in the world. Great photo of a FAV in action. Unknown location. 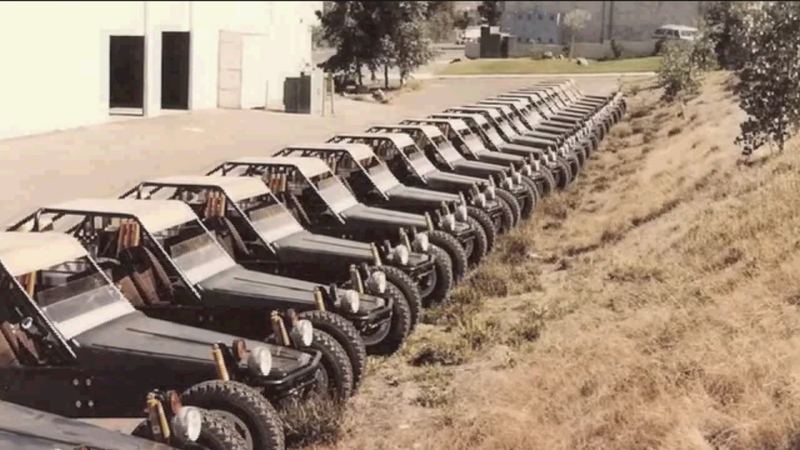 20 completed Chenowth Fast Attack Vehicles lined up at their manufacturing facility in El Cajon California. Soon they will be delivered to Fort Lewis for modification to Army standards. The bodies are painted black, the shocks are yellow and the wheels are white spoke. 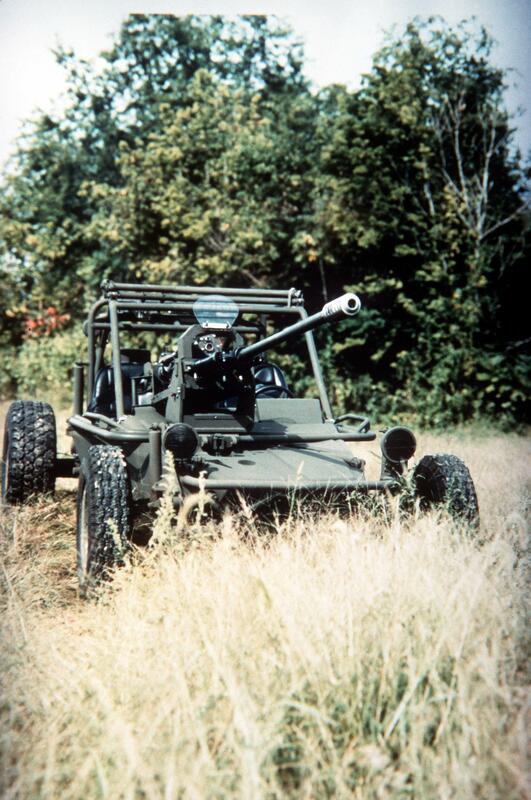 The metal roofs will soon be removed on many to mount M2 50 caliber machine guns and MK19 40mm Granade Launchers. How many FAV'S can you see in this photo? There are 7. 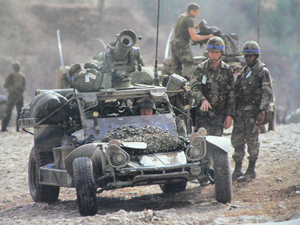 Taken at the motor pool in 1982 at Fort Lewis. The 4 on the left are just as they were delivered from Chenowth. 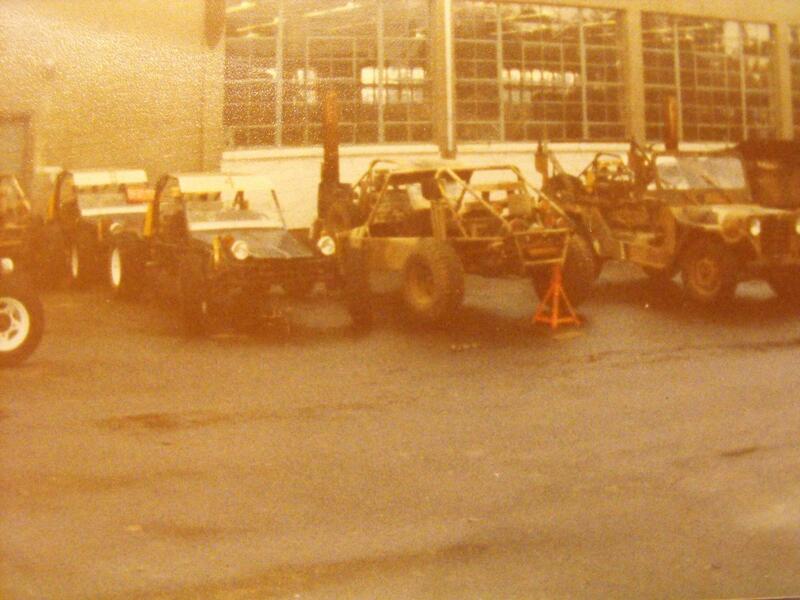 The 3 on the right have already been modified. This area was called the "SKUNK WORKS" at Fort Lewis. This is Phillip (on the right) on the radio during an exercise at Yakima. 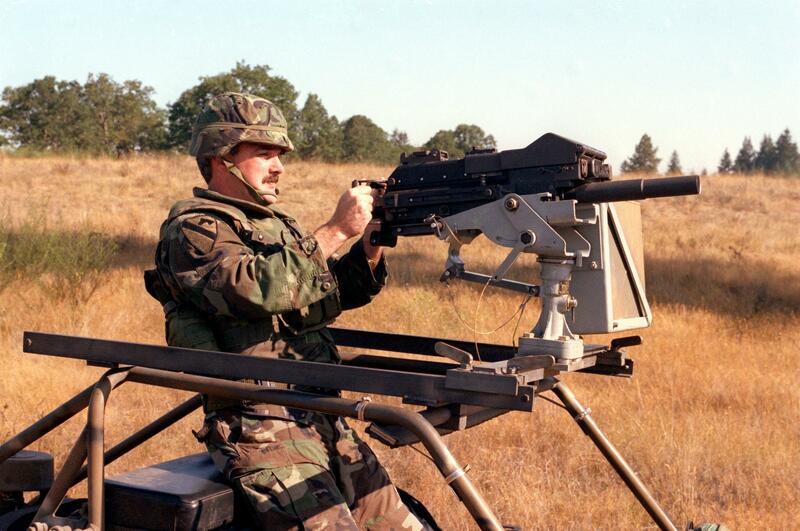 His FAV, like Manuels, carried a ground vehicle laser locator designator (GVLLD) operated by Phillip. Here Phillip is setting up the GVLLD with his FAV in the background. 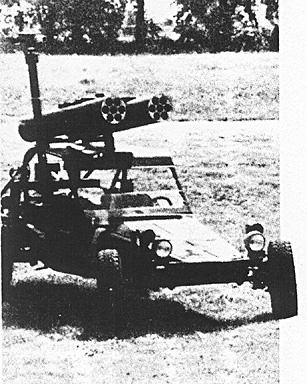 Early robotic version with twin M260 rocket launchers. 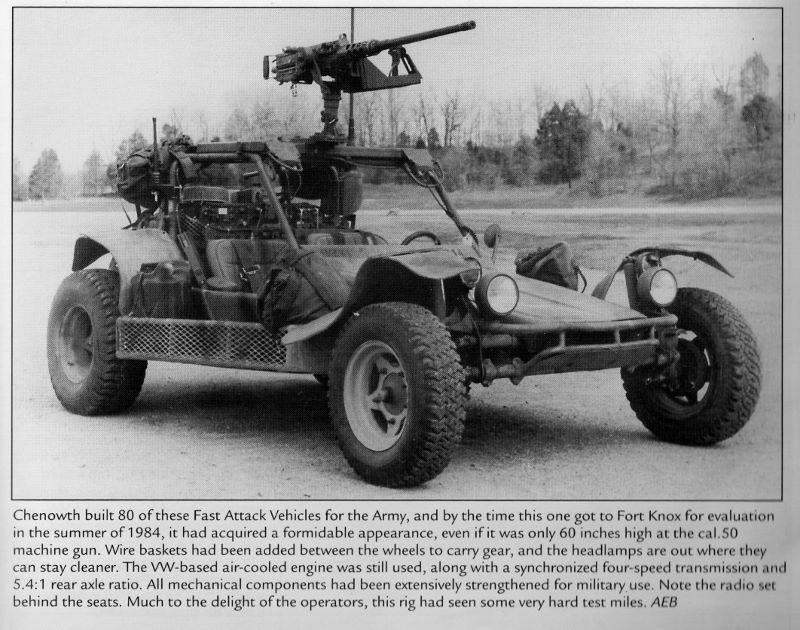 This was the Army version of a unmanned robot Teleoperated FAV. 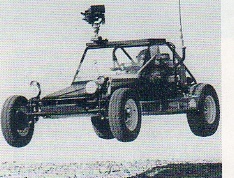 It was remote controlled by an operator using a 3D visor. Sitting in the drivers seat is a robot with 2 huge eyes that the operator actually looked thru using the visor. 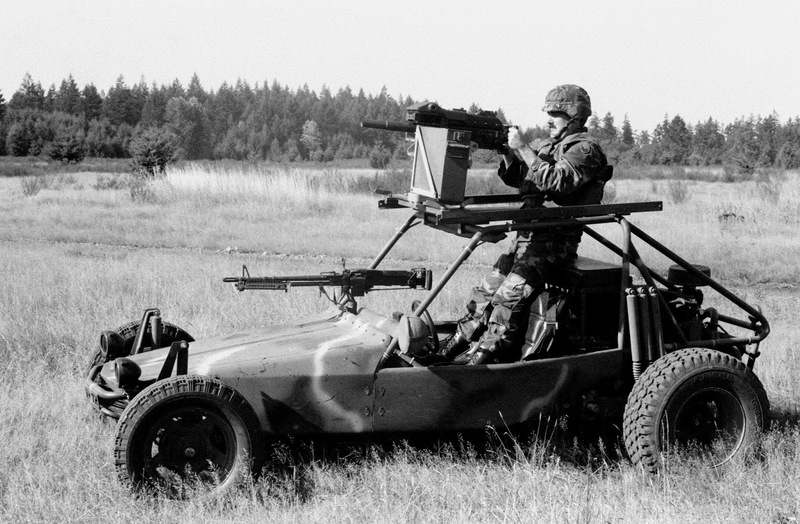 The operator could also aim and fire the M60 machine gun. 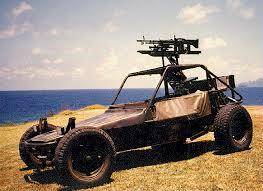 This version has the MK 19 Grenade Launcher and M60D machine gun. Taken at Yakima at Fort Lewis. 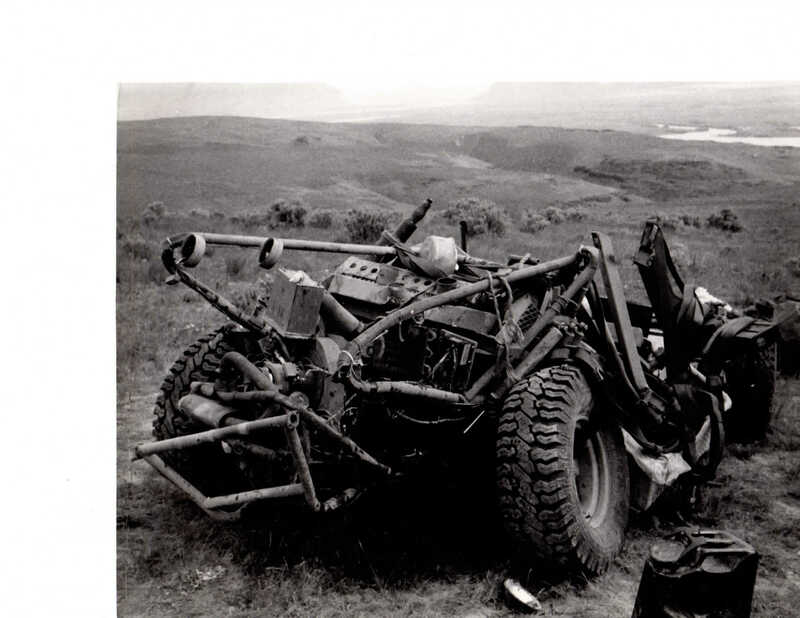 Another view of the MK 19 and the platform designed to break away in a rollover so the weapon could still be used. 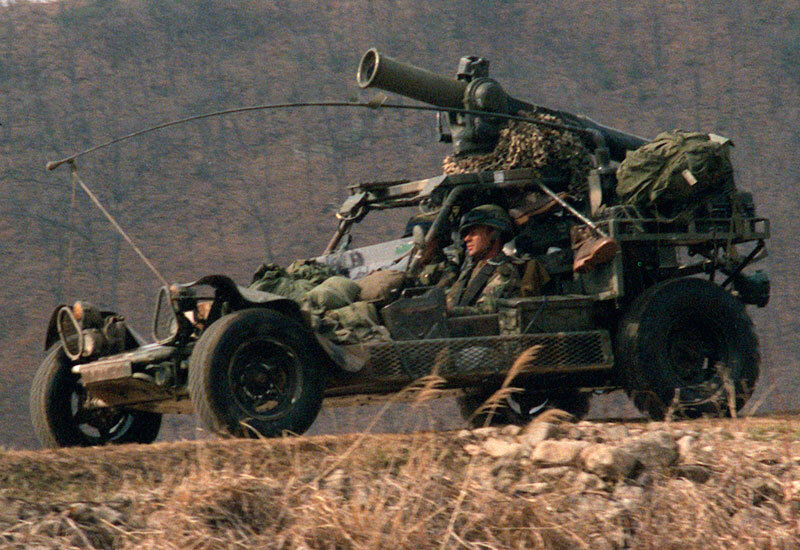 30mm Chain Gun. Taken at Fort Lewis in October 1984. 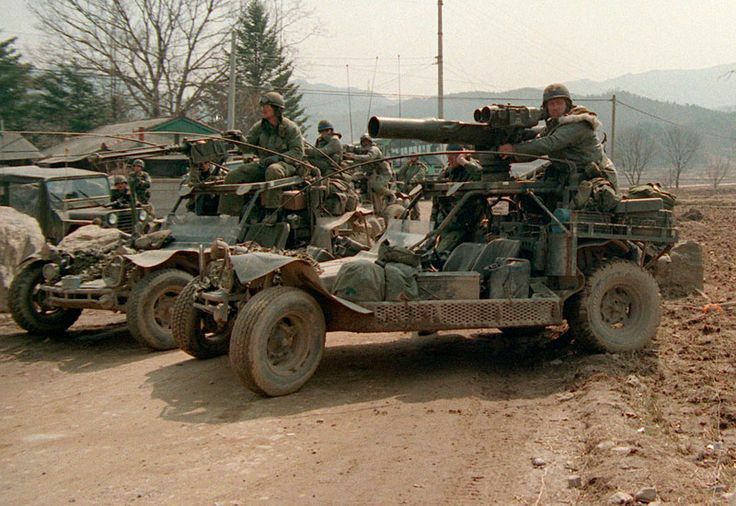 This weapon caused the front wheels to come off the ground so it was never considered. 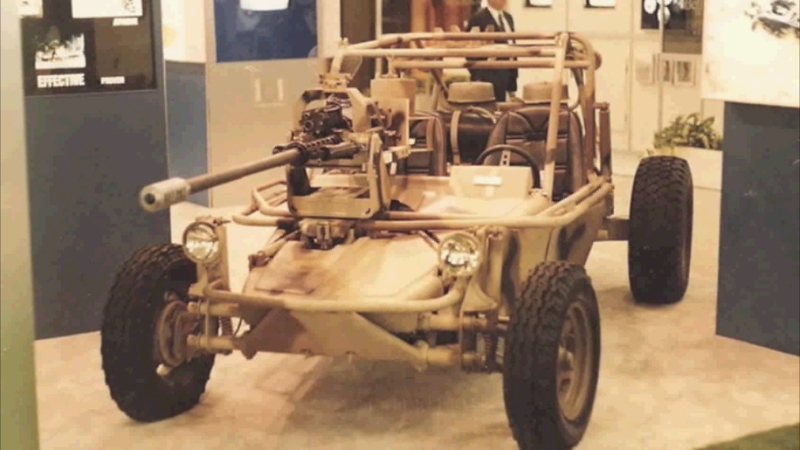 This FAV with the 30mm gun was on display in the Chenowth building. No idea where it is now. An early version from September 1982. 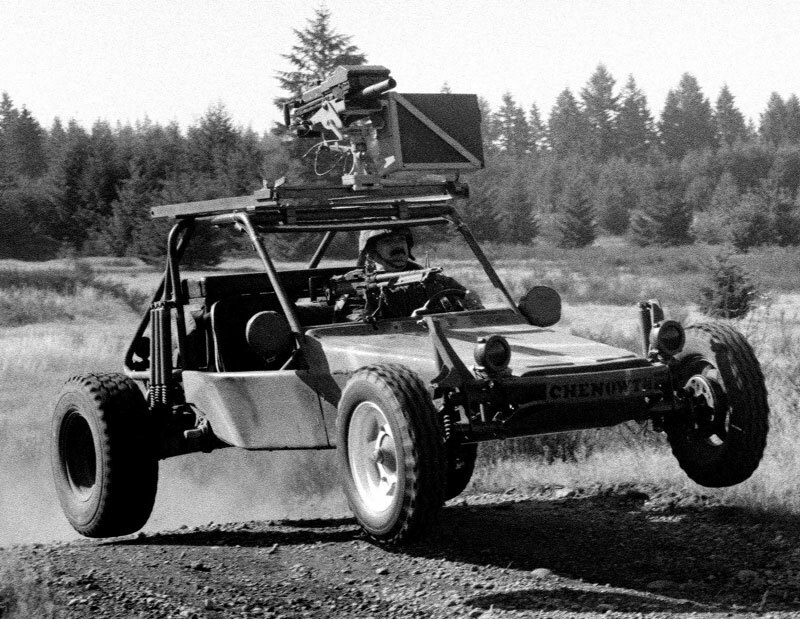 Notice the single VW carb, single air filter, round dune buggy fuel tank, cushion for the soldier to sit on and no side pods. All of these would change in the 1985 rebuild. Doing what they were designed for. 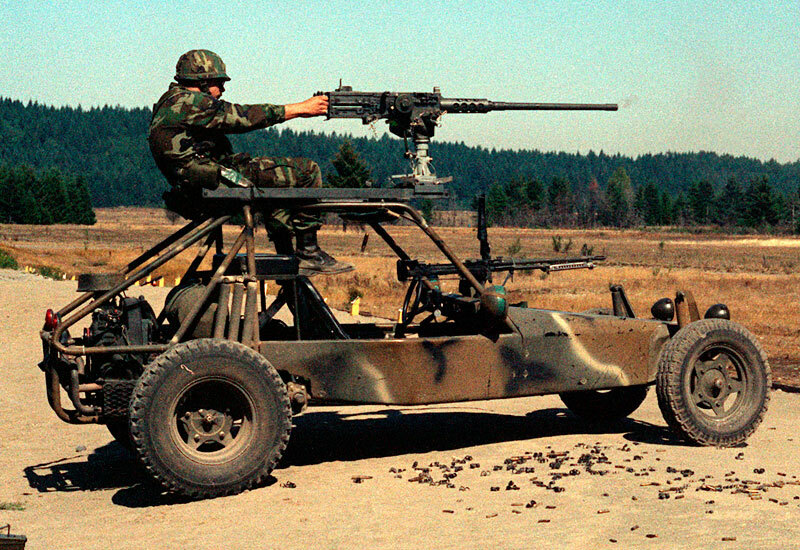 Try this in a HMMWV! Another early version. 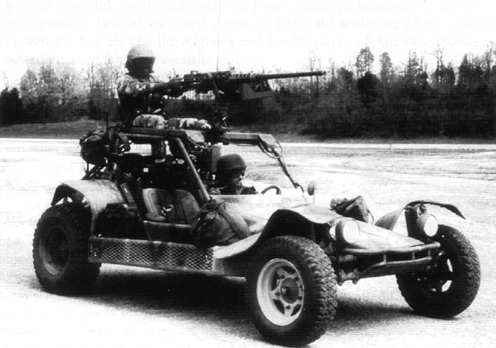 This one with a M2 .50 caliber Browning machine gun and a M60D. Taken at Yakima. This comes from a new Friend Manuel Ocasio. He used a FAV at Fort Lewis. I had my FAV on display at a Veterans Day event and he shared these fantastic photos with me. 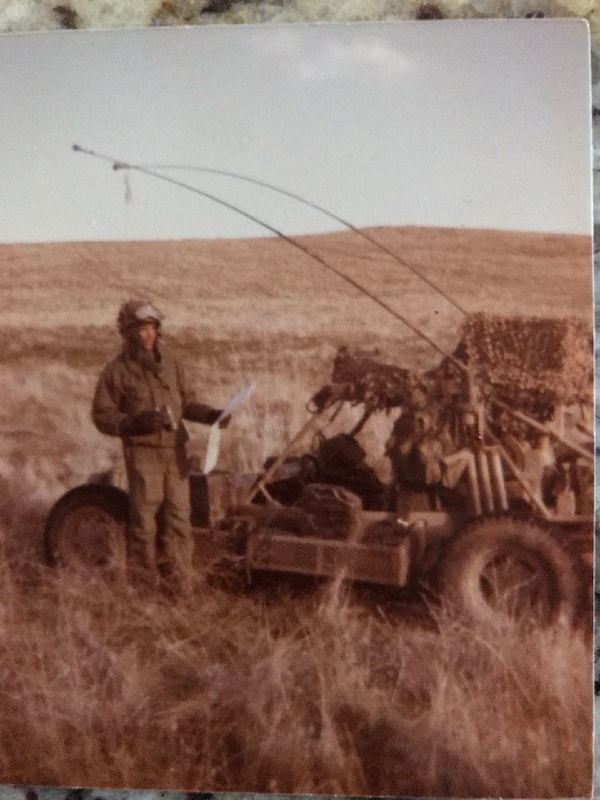 Here he is operating a Ground/Vehicle Laser Locator Designator as part of a Forward Observer Team with the 3/34 Field Artillery Battalion. The GLIDD is mounted on the top rail of this FAV. Also from Manuel. Four FAV's at Yakima. 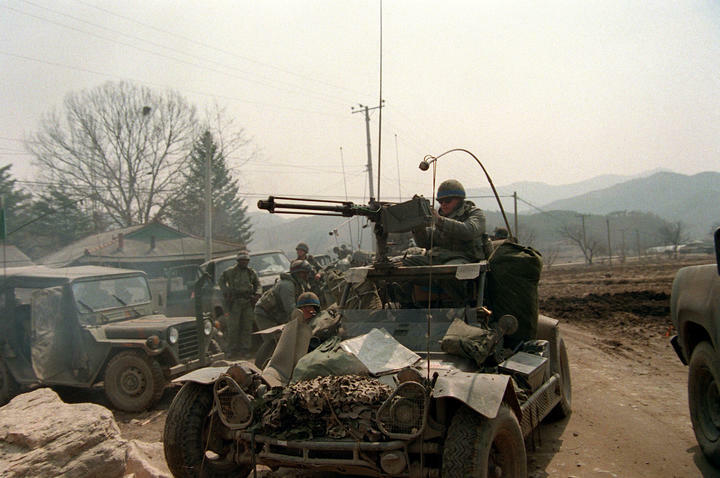 Notice the 2 antenna on some of the vehicles. These have the side pods but do not yet have the fenders mounted. In May of 1983 A newspaper dedicated to the Yakima Firing Center at Fort Lewis published a story about Laser Mace. Here are a few pages from the story provided by Manuel Ocasio. Notice that he is mentioned and photographed in the article. Yes. That is 6 Fast Attack Vehicles being carried by a Army Chinook CH47d. I wish I had the other 9 issues! Manuel was a Forward Observer and a GLIDD Operator attached to the 3/34th Field Artillery Battalion. 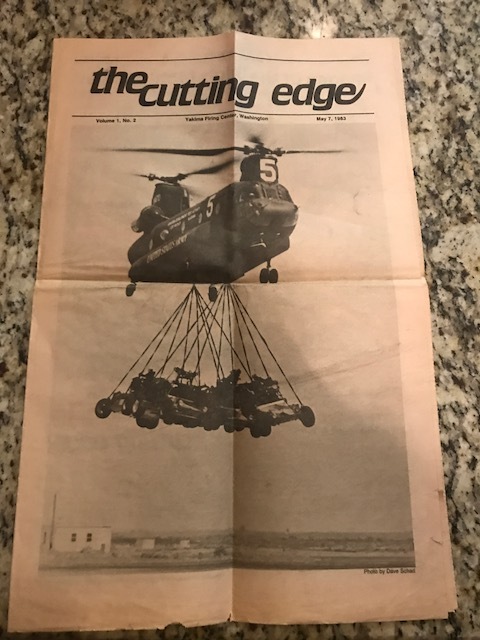 The top photo is after the CH-47 released the 6 FAV's with the full crew. Lower photo shows a FAV right after the slings were dropped. 125 vehicles, 800 soldiers, 90 C-130 Hercules and at least 6 FAV's participated in Operation Laser Mace. 24 years ago Manuel was honored with a photo of him and his GLIDD in The Cutting Edge Newspaper. 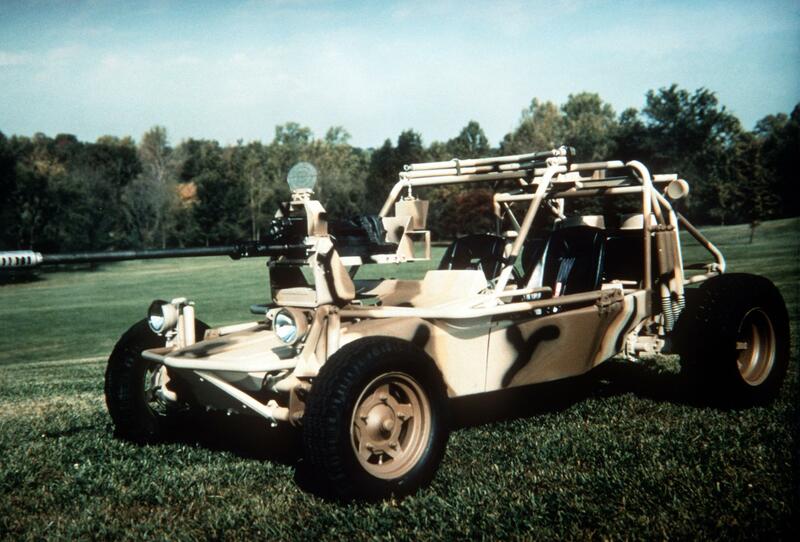 A Fast Attack Vehicle transported Manuel and the Laser Target Locator during Operation Laser Mace. 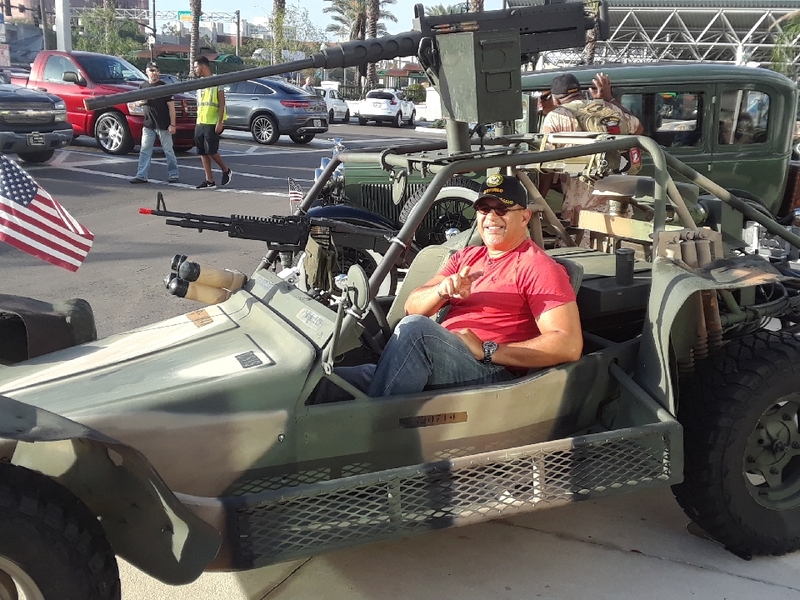 Here is Manuel Ocasio when we met on Veterans Day 2017 at The Ace Cafe in Downtown Orlando and sitting in a Fast Attack Vehicle once again after many years. 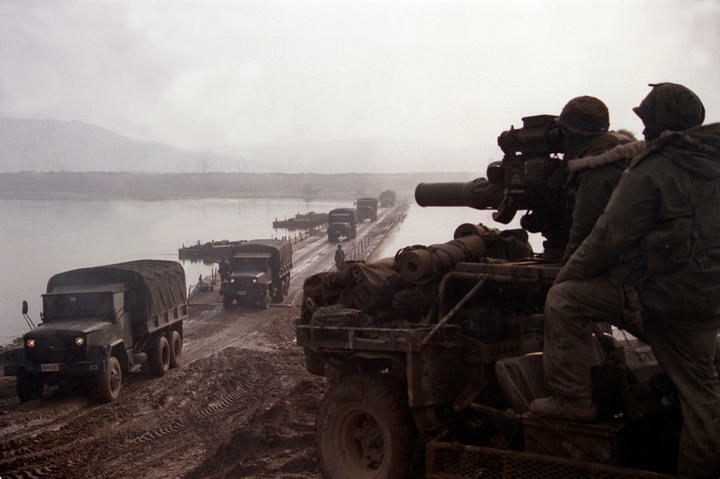 A annual event since 1976, will begin on or about Feb. 10 and involve forces currently in South Korea and from other locations within the U.S. Pacific Command and the U.S. mainland. 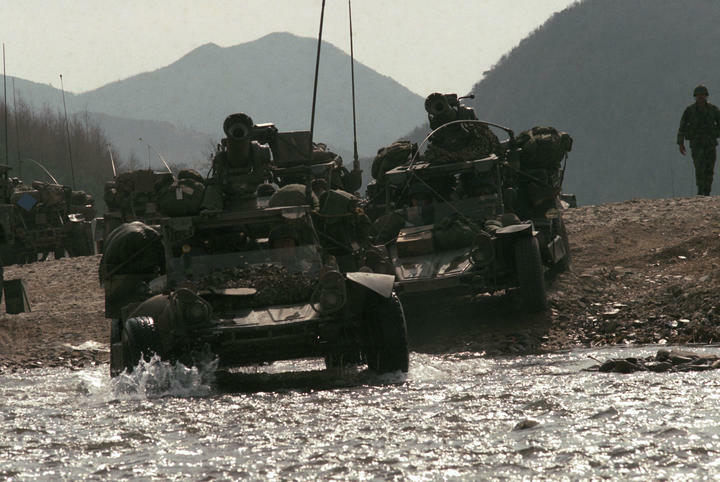 The purpose of the exercise 'is to increase the defensive posture of the Republic of (South) Korea and U.S. support forces,' the announcement said. The exercise, which includes the reception, staging, employment and redeployment of out-of-country U.S. augmentation forces, usually lasts two months. 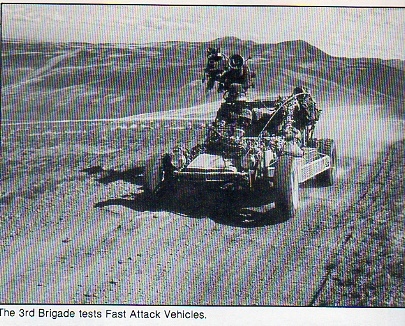 The Fast Attack Vehicle played a major role in the exercise. 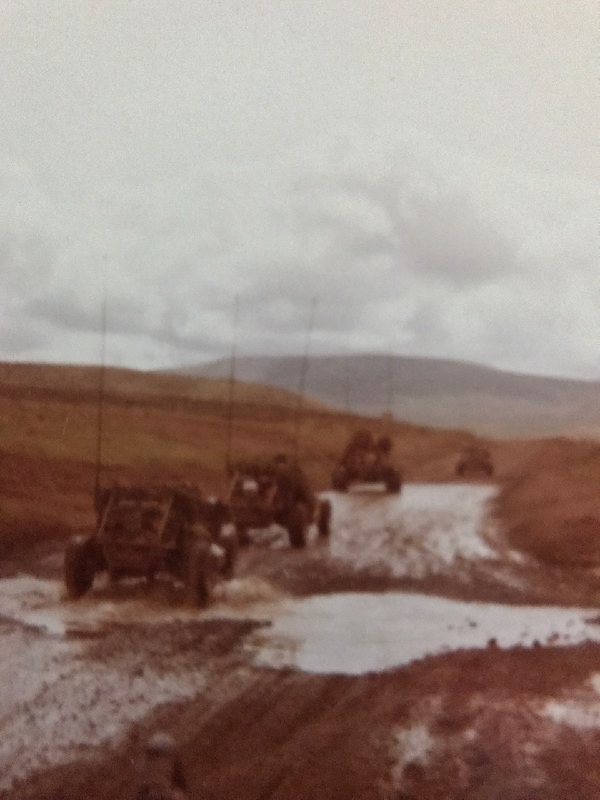 It was here that the FAV was put thru hundreds of real-life tests to see if it would become a integral part of the Army infrastructure. 20 FAV's were shipped to South Korea for the operation. Here are photos from the exercise. The most powerful version built. A TOW. This FAV could take out a Russian Tank and worked very well. 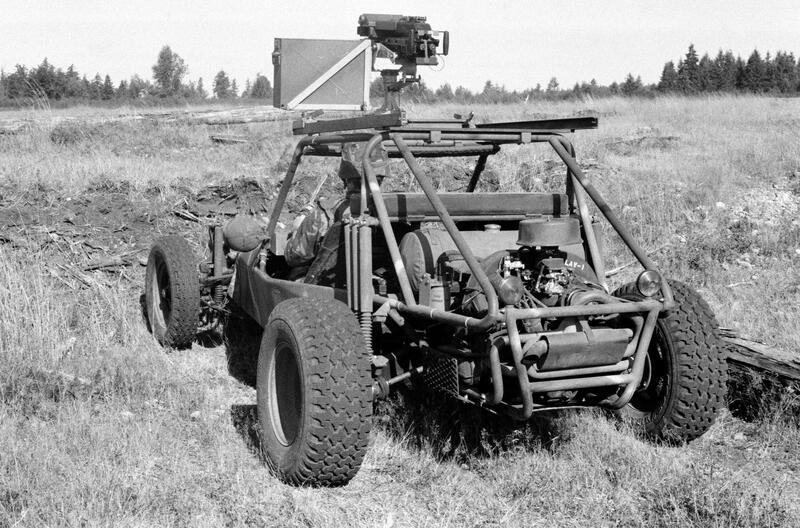 A Army regulation stated that all vehicles with a TOW (Tube-launched, Optically tracked, Wire Guided) had to have 3 men to operate it. Taken in South Korea. Another version of the TOW Fast Attack. 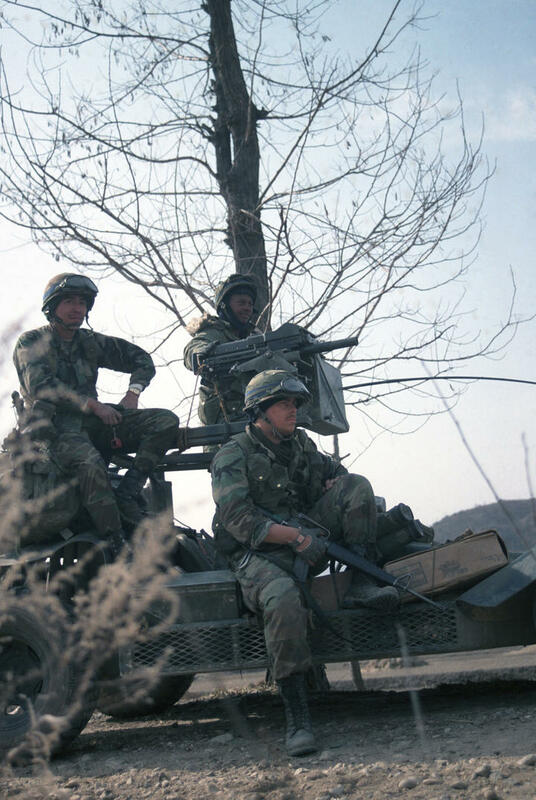 Taken during the exercise in South Korea in 1986. Every inch of space is used to hold personal gear, equipment, spares and ammo.